William Henry Knife will be one of the door prizes for our attends who are on the shows mailing list! In addition there will be a John Young and Joel Chamblin joint project give away also!Check back for addition knives to be given away at this years show! email dan@plazacutlery.com for any questions! Admission is at the door, and is $15 per-person or $25 for a two day pass. Cash only, no credit cards or checks. Day parking is FREE !!!! 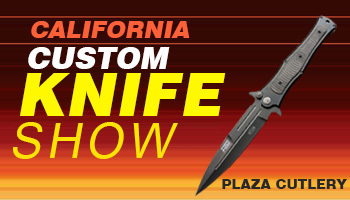 Show Info:The “California Custom Knife Show” sponsored by Plaza Cutlery. This was the first major show on the west coast, and has returned to the greater Anaheim\Disneyland area where our show was originally located making it more convenient for attendees from Orange County, as well as Los Angles County. The format will be the same as the first show in 1981. We will feature the best in custom knives, a few hand picked small semi-production companies, as well as suppliers, and engravers. This has always been a fun show with a nice crowd!The Embassy Suites is located in the row of hotels that run down Harbor Boulevard from Disneyland to just past the Anaheim Convention center. The show starting on Saturday morning makes it very easy to attend, and you can be there when the show opens as there should not be much traffic on the freeways Saturday morning. So if you are in San Diego to Santa Barbra you can drive down in the morning, and return home in the evening very easily. But why not spend the night and enjoy the weekend in this resort area? Disneyland and South Coast Plaza are close by!One difference in this show compared to others, is that each knife maker will be asked to sign a pledge that they will not sell any knives till the show opens to the public and then wait 10 minutes so everyone has a chance to get to the knife maker they want to see and possibly buy from. Some knife makers such as John Young, Les George, Ernie Emerson, and Rick Hinderer will do drawings a later after opening. Each maker at 10:10 will then sell his knives and if more then one person wants the same knife they will do a drawing for that knife using a deck of cards. Each maker will have a deck of “Plaza Cutlery” playing cards which are available for $10. Hopefully each person gets what they want, if you are there when the show opens Saturday morning. We will also post the names of the makers below who make the pledge, and the one’s we know will need to do a drawing below next to their names. (Will be updated in July) Dealers will also be asked to sign a pledge not to try, and buy before the show opens. This way the dealers will not buy everything up, me included! 🙂 We want you at the show and to be able to get a knife! This will not included knife makers who are delivering your knife at the show so they do not have to ship it.The show will be held in the ball room, and you can enter from the ball room side of the front of the hotel, or from the back side. We will have signs posted, and it is a smaller hotel so very easy to get around. Parking for both exhibitors, and attendees is free during the day!! If you are there over night it is a fee of about $12.. There is no gate so you can park any where around the hotel, and there is a lot of parking in the back that hopefully the exhibitors will use so guest can park out front. In addition the “Embassy Suites” offers a full breakfast to the hotel guest, and they are extending it to the attendees for $10 per person. This included an omelet station and all the usual breakfast buffet options. I will post more as it gets closer. Table Info:Tables are available to knife makers, scrimshanders, engravers, Mid-tech manufacturers, dealers (hand made knives), and collectors when the waiting list is filled. No factory knives, or sharing of tables. The show will be the same size as 2013. So please contact me as soon as possible if you are interested. If interested in a table please email me at dan@plazacutlery.com . At this time we do have a waiting list. Directions:Going North on interest 5:Take interstate 5 north. Exit Harbor boulevard and turn left on to Harbor. Drive about a mile and half past Disneyland, Anaheim Convention Center. The hotel sets back and is just before Chapman avenue. There is an Italian restaurant “Baca Di Beppo” in front of it, but there is a sign that direct you into the Embassy Suites. Easy to see from there. Going South on interest 5:Take interstate 5 south. Exit Harbor boulevard and turn right on to Harbor. Drive about a mile and half past Disneyland, Anaheim Convention Center. The hotel sets back and is just before Chapman avenue. There is an Italian restaurant “Baca Di Beppo” in front of it, but there is a sign that direct you into the Embassy Suites. Easy to see from there. To win the above “One of a Kind” William Henry Knife or the John Young Joel Chamblin Knife!! The William Henry B05 “One of a Kind” knife will be featured in our advertising for the 2014 show. It has a damascus frame and blade with a mammoth ivory inlay. It also comes with a presentation box! (Young\Chamblin info will be inserted here when we have the knife) This will be the knife featured in our show ads, and flyers! You can win it on Sunday of the show. If you have attend our show in the past, and receive the post card reminder in the mail just bring it to the show, and turn it into the front desk with your show admission. If you have not attended, or did not fill out the slip, please send your name, and address to show@plazacutlery.com and we will add you to the list and you will receive the card in the general mailing in September. Please bring the post card with you to the show, and deposit it the marked drawing box. If you can’t make the show, sorry you will miss out! We will also have regular door prize drawings, please check the door prize board out front through the day. The advertising knives special door prize drawing on Sunday will be just before the Hinderer lottery. Additional door prizes will be posted! The Embassy Suites last year did not extend the room black so make room reservations early! If you wish to stay at the Embassy Suites a suite with a King is $129 plus tax’s or a double bedded suite is $149 plus tax’s.Also all rooms have an additional sofa bed, table and television in the front part of the suite separated by the bath room. Each room that has 3 or more guest has an addition charge of $20.00. Check with the hotel for any questions. Breakfast for all guest in the room is also included as well as the “Managers reception form 5PM to 7PM which includes beer and wine. ill add the Pledged in Summer as we will have all the paper work at that time. I am sure most all of the makers will! This is the start of the list. Check back as it will update!